In Your Hands, It Makes Cleaning Easy. In Our Hands, It Absolutely Cleaned Up. The H2O Mop line might be the purest example of the Thane philosophy at work. At Thane, we don’t believe in one-off products. We spend our days (and nights!) turning great products into entire product categories. In the beginning, the H2O Steam Mop was one product, and our focus was on making it the best it could be. The Thane team spent a year refining and perfecting the H2O Mop, and the result was a revolutionary product that delighted customers with its ease, it’s ability to clean and sanitize, and the remarkable way it Just Worked. By March of 2008, the H2O Mop had shipped over 550,000 units. A wonderful success! But at Thane, success isn’t an end point. It’s just the beginning. Thane’s passion to make every product better spawned an incredible evolution… from a single product into an entire product category. We obsessively found ways to evolve the H2O in all directions: some smaller and even more portable, some turbocharged and even more powerful. We innovated ways to eliminate harsh chemicals in cleaning, and we developed an entire line of green accessories. Through incredibly watchable infomercials, shopping networks, online venues and retail outlets, we expanded the line domestically. And we used our international expertise to grow the H2O line worldwide. Today, the H2O line has shipped more than 11 million units, and is synonymous with Green Steam Cleaning cleaning in more than 80 countries! 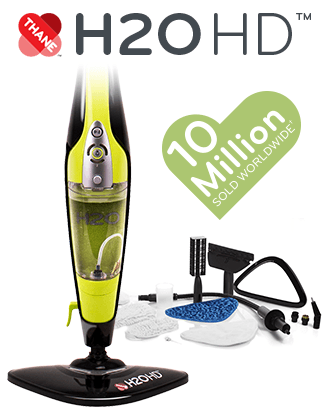 And most importantly, the H2O brand introduced the world to a whole new way to clean. A new product category. In our advertising, the H2O line goes, “Just add water.” Here at Thane, we like to think we also added passion, vision, and expertise. And The Result Has Been a Clean Sweep For an Entire Product Category.